Rush have confirmed their first European festival appearance in over three decades. In support of their new album, “Clockwork Angels,” the Canadian rockers will play the 2013 edition of the Sweden Rock Festival, which happens June 5-8, 2013 in Sölvesborg, Sweden. Rush will appear on the festival’s closing night of June 8. 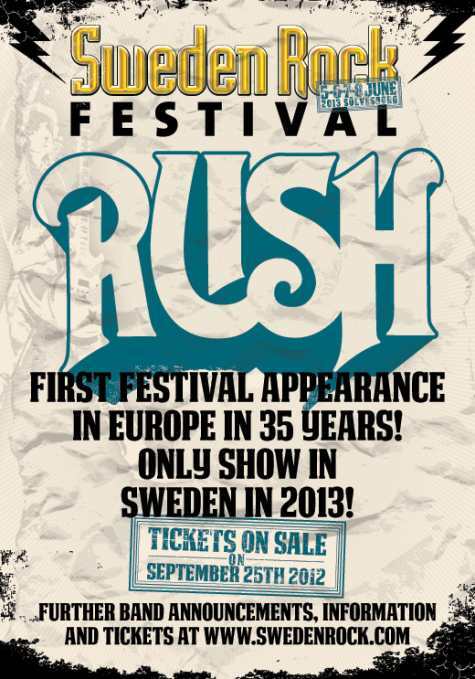 Sweden Rock Festival 2013 will be a four-day festival featuring a total of 80 bands performing on five outdoor stages. Tickets will be made available September 25. Rush’s "Clockwork Angels," the band's 20th studio album, will be released on June 12th; the project's lead single, "Headlong Flight," is out now.